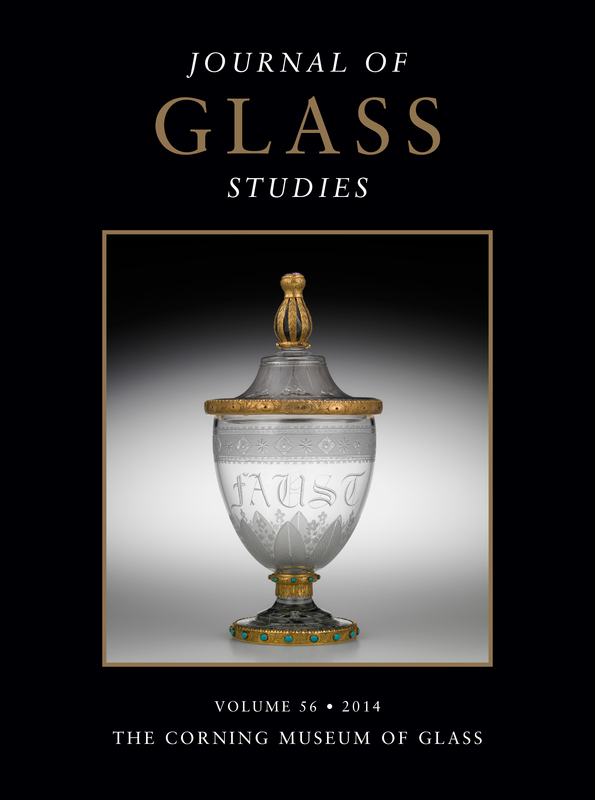 The Journal of Glass Studies presents original research on topics related to the history of glass from its beginnings to the mid-20th century. The 2014 volume, the largest since its inception in 1959, contains articles about blown bowls and plates from the second century, a reverse-painted glass “paten” at The Cloisters in New York, Islamic lead glass and Mīnā, early Baroque glass cutting in Frankfurt and the Hess family, a dichroic glass fragment from Alexandria, glass and glassworking in Damascus from the late 19th to the early 20th centuries, and the manufacture, conservation, and display of The Chariot of Poseidon, a monumental reverse-painted glass mural at The Metropolitan Museum of Art, just to name a few. The Journal also welcomed session papers from the 46th International Congress on Medieval Studies. Sponsored by the International Center of Medieval Art and titled “Glazing and Stained Glass: Collaborations, Analogies, and Investigations Involving Stained Glass and Other Disciplines,” the six articles report on new approaches to medieval windows in relation to artistic practices, other works of art, liturgical performance, the beholder’s share in reading the window, literary images, and spirituality. This article investigates two groups of shallow colorless bowls and dishes dated from the mid-second to early third centuries. Poorly surveyed until now, these forms are frequently found in the western Mediterranean (Italy and Gaul). The first group, which consists of shallow bowls with a wide, out-turned rim and a ridge on the underside of the rim (type AR 38), is widely distributed in the western provinces, north and south of the Alps. The singular, probably peculiar engraved decoration of some pieces discovered in Provence suggests a regional production. The second group, characterized by a triangular rim, is common in coastal sites of Italy and in the province of Narbonensis. This group, which is similar in date to the first one, may have been produced by workshops in the Mediterranean region. This article discusses a rare find of dichroic glass from recent archaeological work on the Kom el-­Dikka site in Alexandria. The piece is considered in the context of the assemblage of late Roman glass finds and associated discoveries from the site, which point to the existence of local workshops producing glass for a local clientele. The fragment of dichroic glass, which probably came from a large bowl, has some preserved cut decoration. It is one of only two pieces of this category of glass known from Egypt. The other example, from Oxyrhynchus, is not as well dated archaeologically. The Kom el-Dikka fragment of this luxurious and very expensive glass can probably be dated to the fourth century. This article presents an in-depth examination of glass beads recovered from ninth-century graves in the southern suburb of the Břeclav-Pohansko stronghold (today in the Czech Republic). The beads were classified using the traditional typological approach, evaluated by manufacturing process, and analyzed in order to determine their chemical composition. The analyses revealed that most of the glass items were not produced locally and should be regarded as imports from the Frankish Empire or the former Roman provincial territories on the Danube. The beads also showed evidence of being imitations of transversely segmented beads. Because no tools or technical devices suggestive of glass production have been found at Břeclav-Pohansko, it is likely that beads of local origin were made using raw glass imported from western or southeastern Europe. The first part of this article takes stock of Islamic lead glass vessels and vessel fragments that have proved (or are suspected, because of their weight and color) to consist of glass with a high percentage of lead oxide. Their lead content ranges from more than 70 percent in pure lead-silicate glass to just under 30 percent. Most of these vessels and fragments are bright emerald green, but a high lead content is also found in glass of different colors (e.g., turquoise). The second part of the article presents quotations from written sources that mention mīnā, a sort of colored glass containing lead. Mīnā is noted in alchemical texts, treatises on (precious) stones, collections of glass recipes, and descriptions of monuments and objects. The written sources indicate that mīnā was used mainly for artificial gemstones or enamels, sometimes for mosaic cubes, and also for jewel-like glass vessels. The duchy of Gandía experienced a great period of prosperity in the arts in the 15th century, partly because of the tutelage of the Borgias, a noble family, originally from Aragon, that was later to settle in this part of Valencia on the Mediterranean coast. The rise through society of the Borgias took them to the Holy See, where they exerted great influence during the Renaissance, particularly Rodrigo Borgia (1431–1503), who became Pope Alexander VI. In 1499, Pope Alexander elevated the church of Gandía to a collegiate church, thus converting it into one of the most iconic buildings in the kingdom of Valencia. Various members of the Borgia family, as well as other priests and persons of noble lineage, are buried there. The archaeological excavations that I carried out in this church between 2001 and 2004 resulted in the recovery of beautiful glass vessels used as funerary regalia, as well as other glass fragments, and the purpose of this article is to analyze and interpret them. The iconography and authorship of a reverse-painted glass “paten” acquired by The Cloisters in 2008 are discussed in this article. The “paten,” dated 1498, is distinguished by its size, the complexity of its painted decoration, and the technical virtuosity of its execution, all unprecedented at that time. The central image represents the meeting of Abraham and Melchizedek, during which the former offers a tithe and the latter provides bread and wine. In the 15th century, Melchizedek’s offering of bread and wine was understood as a prefiguration of the Last Supper. Clearly presented in a sacerdotal context, Melchizedek is dressed in full episcopal vestments, and he signals Christ’s sacramental role and the institution of the Eucharist. The scene takes place in a developed landscape; the city in the background is readily recognizable as Landshut. A record in the cathedral of Freising, whose arms are emblazoned on the “paten,” notes that a Hans from Landshut was paid to paint a glass vessel. This Hans has been identified as Hans Wertinger, but this seems unlikely. The glass painting is the work of an accomplished master, and the style does not accord with Wertinger’s only known youthful work of that date. A large, shallow dish of colorless glass in The Cloisters of The Metropolitan Museum of Art is decorated with a reverse-painted image that includes the arms of the city of Freising and its bishopric, as well as the date “1(4)98.” It was therefore identified as the glass that is mentioned in an entry of the “Domcustos” accounts of the Freising cathedral. According to that entry, the decoration was added to a glass that had been kept within the treasury, probably one of “duo vitra magna” listed in an inventory of 1456. These large glasses would have been exotic pieces brought to Freising from some Islamic country because examples of similar large traylike dishes are found only among Islamic glass, whereas that form is completely absent within the range of medieval European vessel glass. While it was still undecorated, the shallow dish had been used for the liturgical washing of feet on Maundy Thursday. It was “Christianized” by the reverse-painted biblical scene when it was assigned the new function of holding the Hosts on Maundy Thursday. In the first half of the 18th century, the brothers Bertolini and Davide Miotti were among the glass decorators working on Murano. We are not able to attribute any particular objects to them because they did not sign their works, but we know a considerable amount about Daniele Miotti because he often added his factory’s mark to his pieces, some of which are ornamented with flowers and birds. Early glass engraving of high quality in Germany is connected mainly with Nuremberg. Its fame has overshadowed that of other places, such as Frankfurt, where three generations of the Hess family, which was originally from Thuringia, were active during the second half of the 17th century. This article focuses on the ties of the family — primarily the founder of the dynasty, Johann Hess, and his highly skilled son Joh. Benedikt Hess I — to Nuremberg and Thuringia, and it documents their efforts to develop an individual style of engraving. Apparently, their work was very successful. Johann Hess came to Frankfurt from Tambach Thuringia in 1642, and when he died in 1689 at the age of 84, he was both famous and prosperous. His workshop apparently took orders both from Frankfurt patricians and from the dukes of Saxony-Gotha. Nearly all of the glasses made by the Hess workshop have been published only sporadically, with incorrect attributions and insufficient illustrations. Some of the glasses are newly attributed here. Copper prints and woodcuts used for the compositions have been identified. Corinthian glass was prevalent in Venetian glassmaking firms during the last three decades of the 19th century and probably the early years of the 20th century. This glass, which was made in imitation of Corinthian (and other Greek) marble and Corinthian bronze, was an offshoot of mosaic glass. It was initiated and named by Macedonio Candiani, probably in association with Isacco Bassano. Beginning in 1877, several members of the Barovier family produced Corinthian glass for Salviati Dott. Antonio. Other 19th-century Venetian firms that made Corinthian glass included Francesco Ferro e Figlio and the Compagnia Venezia Murano. Lorenzo Radi Jr. and Luigi Dalla Venezia were reported by Vincenzo Zanetti and Angelo Guadagnini to be producers of Corinthian glass. Emile Gallé created many drawings and documents that were necessary for the artist and his team to conceive and produce pieces of ceramic, glass, and furniture. Some of them, however, had another goal. They belong to the “Album des Prud’hommes,” which helped to protect Gallé’s works from copyright infringements. Between 1880 and 1902, Gallé collected drawings and texts describing his production, and he made 11 official registrations to the Prud’hommes. The Rakow Research Library of The Corning Museum of Glass owns three of these albums, one from 1880 and two from 1895. These documents, whose value is more legal than artistic, are nevertheless very interesting because they help researchers understand how Gallé conceived and created his pieces. This article compares some of the drawings with a few pieces housed in the Musée de l’Ecole de Nancy. The three albums in Corning show the evolution of the artist’s work, his sources of inspiration, and his desire to control his production and its future use. These albums reveal both an artist and an attentive and farsighted entrepreneur who was aware of the need for mass production. This article collects textual sources and artifacts as evidence for glassworking in Damascus in the late 19th and early 20th centuries. The main focus is a group of descriptions of glass-related crafts in an Arabic text titled Qāmūs al-s.ināʿāt al-shāmiyya (Dictionary of Damascene crafts), written in the last decade of the 19th century and the first decade of the 20th century. Examples of the products of these craft practices are sought in the collection of the Doris Duke Foundation for Islamic Art at Shangri La in Honolulu, Hawaii. The final section places the evidence in a wider economic context, with particular reference to the importation of European glass to the Middle East. The conclusion reflects upon the ways in which traditional Syrian crafts, including glassworking, adapted themselves to the increasingly challenging economic climate in the late Ottoman and Mandate periods. This article describes the manufacture, conservation, and display of a monumental reverse-painted glass mural titled The Chariot of Poseidon. It was designed by Jean Dupas (1882–1964) and created by Jacques-Charles Champigneulle (1907–1955) for the SS Normandie, and it is now in the collection of The Metropolitan Museum of Art, New York. This article analyzes the shifting roles of the designers and creators of Italian stained glass windows from the 14th to 15th centuries through close study of several windows from the three major glazing campaigns in Florence Cathedral. While the glaziers who created the 14th-century nave windows in the cathedral made key decisions about color, composition, and ornament, 15th-century glaziers faced a demand that they recreate with precision the designs of painters and sculptors who worked in the new style of early 15th-century Florence. Consequently, glaziers had to invent new ways of cutting and leading stained glass windows in order to accommodate the monumental figures and large expanses of single colors required by these opaque designs. While these adaptations were achieved with different degrees of success, the change in the roles of designers and glaziers in the production of stained glass ultimately led to a new conception of the function of stained glass windows in the church interior. The multifaceted and multidirectional interaction between stained glass windows and reliquaries within a sacred environment is explored through three examples. The shape of a reliquary can inform the imagery in a window, as at the church of Saint Just in Flums, Switzerland. More commonly, a complex dialogue ensues with both media working in concert to fashion a more all-encompassing sacral environment, as in the choir of the Church of Saint Ursula in Cologne. At times, the arrangement of windows and relics in a specific church can influence the imagery on more distant reliquaries, such as Hans Memling’s Shrine of Saint Ursula, which I argue may have been influenced by the Ursulaschutzmantelheilige window in the choir of the church in Cologne. This article considers how we might productively juxtapose the study of medieval stained glass and the study of liturgy. Central to the argument is the notion that both narrative stained glass and medieval liturgical rites can be understood as spatial practices. In their concatenation of scenes, narrative windows of the 12th and 13th centuries create what might be termed maps of the medieval world. These maps are undergirded by ideologies of space that were in play during that period. At heart, these maps can be read as interventions, as attempts to remake the medieval world for the sacred. The article closes with a consideration of the limitations of this window:liturgy analogy. Using the case study of the early 16th-century glazing scheme of the Church of Saint Mary in Fairford, Gloucestershire, U.K., this article explores evidence of the ways in which stained glass narratives may have been conceived, accessed, and read by the late medieval parish. Incorporating the evidence of surviving wills, the archaeology and architecture of the church, important antiquarian evidence, and a close reading of the surviving medieval windows, the article proposes that the scheme was devised in a book­ish mode: its carefully arranged narrative — in the eastern chapels in particular — invited parishioners to cross the permeable divide between chancel and nave, clerical and lay space, and to engage with stained glass as an aid to devotion and liturgy. That these narrative windows, significantly devoid of text, were read with the aid of complementary texts, perhaps in the form of the publicly accessible tabula — for which elusive but compelling evidence is found elsewhere — is also discussed. So too is the importance of the building and its windows in reinforcing the social pre-eminence of the aspiring Tame family, wealthy wool merchants who were formally raised to the knightly class on the very eve of the Reformation. This article explores the use of stained glass as a framing device for interpretation in Chaucer’s The Book of the Duchess (about 1368–1372) and the anonymous poem The Tale of Beryn (about 1420–1460). The abilities of stained glass to transmit light, to shift colors with environmental conditions, and to inter­act with surrounding sculptural and painted images provide these two English poets with material images that embody similar operations in narrative. Through the interpretive framework of stained glass, literary narrative can be understood to exceed its boundaries, to respond to the conditions of its audience, and to interact with other narratives. The author seeks to understand how the visual materiality of stained glass can frame perception and literary interpretation. A disquieting window panel shows the crucified Christ locked in an intimate embrace with Caritas, who is thrusting a dagger into his chest. This 14th-century version of the Crucifixion with the Virtues assumes the place of the Crucifixion scene in the Passion cycle of the glazed upper cloister at the Cistercian women’s abbey at Wienhausen in northern Germany. A comparison with related motifs in biblical exegesis and devotional literature, as well as with various visual media, especially manuscript illumination, shows that the window panel is unsurpassed in its display of seeming treachery and duplicity. The panel engaged this monastic community cognitively and emotionally amid an almost habituated display of images exhibiting blood, wounds, and weapons that surrounded the women, and within the recurrent Passion and Easter rituals performed by and for the nuns during the late Middle Ages. The article questions the functions of implicit sexual violence when used metaphorically.